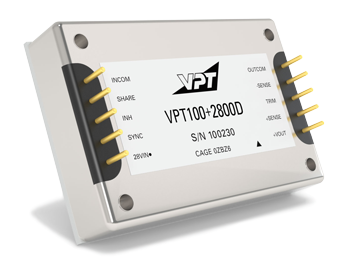 VPT100+2800D DC-DC Converter | VPT, Inc. Packing 100W with a power density greater than 60W/in3, the VPT100-2800D Series of converters offers extremely efficient operation. The VPT100-2800D is based on proven, military heritage electrical designs and ideal for military vehicle, shipboard, weapons, commercial avionics or other hi-rel applications.